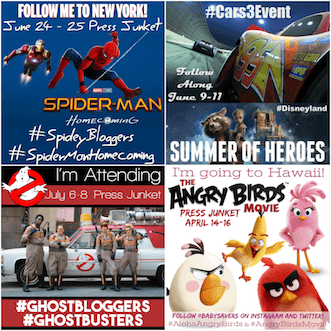 Last weekend I had an amazing time joining a few other bloggers at the Ricki and the Flash press junket. The first night I was treated to a makeover and dinner out at a fabulous New York City restaurant. The following day I woke up, threw on a dress and got ready to meet Meryl Streep, Rick Springfield and Mamie Gummer at the Ricki and the Flash press conference. 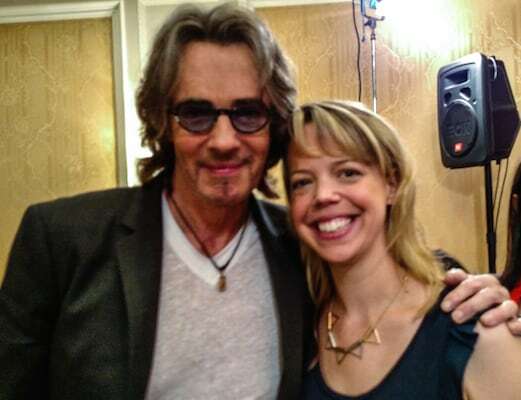 I didn't know that there was a plan to have a few minutes with Rick Springfield before the conference started, which included time for pictures! After we all had exhausted our opportunity to take a picture with him, Rick Springfield, glanced around, and said, Well, we still have a few minutes. I think my head almost exploded when he walked over to the edge of the platform in the room, picked up one of the prop guitars and started playing! After the short performance and a few minutes of downtime, Rick Springfield returned with both Meryl Streep and Mamie Gummer to talk all about Ricki and the Flash. 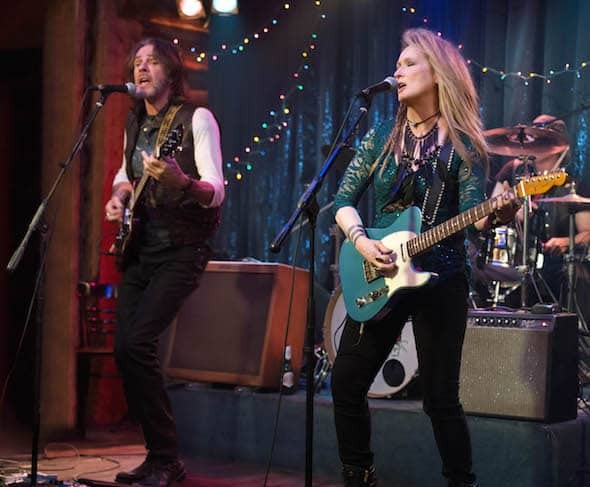 It's been a roller-coaster ride for Ricki Rendazzo (Meryl Streep), a one-time wife and mother of three who left her family behind to follow her dreams of rock ‘n' roll stardom. 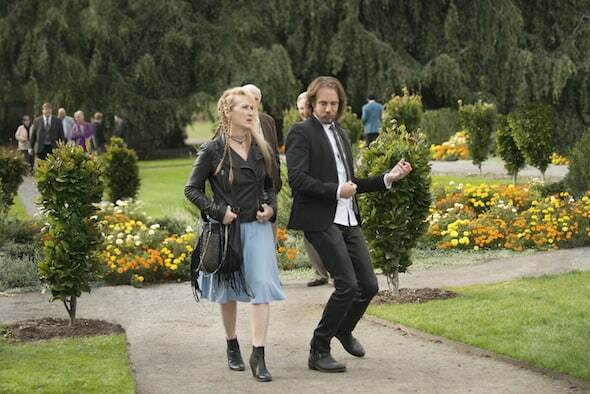 Now, the singer and guitarist must face the music when she returns home to Indiana to reconnect with ex-husband Pete (Kevin Kline), troubled daughter Julie (Mamie Gummer) and engaged son Josh (Sebastian Stan). Filled with regret, Ricki hopes to find redemption for all of the bad choices that she made in the past. I think that the hardest part of becoming a mother is that you suddenly have to choose how much of your life is about you and how much is about your children. In the movie Ricki made the choice that was best for her. Ms. Streep, was there ever a time that you were offered a professional opportunity that you really wanted to take but ultimately turned down because you felt that was the right choice for your family? Meryl Streep (MS): Well, I kind of got lost thinking about all those things in the middle of that question. The last thing you asked was the question, right? Sorry. I loved the music in the movie and I loved seeing you perform, Meryl. I especially loved seeing you two perform together in the movie [Meryl Streep and Rick Springfield]. Did you have any say in the songs that you got to sing in the movie and how do you feel about the music you performed. 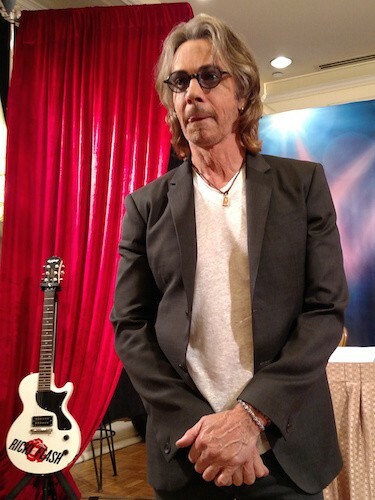 Rick Springfield (RS): She's great. RS: Yeah, there were some difficult songs, though. That Edgar Winter song had a lot of riffing in it. I think that was a great choice. When I first heard some of the songs I was like, “really?” But once we played them, and they allowed us to arrange the songs, too. That was great, we all had a say in how the songs were arranged. It really worked with the band and through the whole story. They're almost perfect songs, in the end. MS: Rick had a lot to do with why it sounded good. I also enjoyed the band. It was a really, really tight band. Great veterans. MS: Mamie had never heard any of those songs before. [To Rick Springfield] Would you consider doing a duet with Meryl on your next album? RS: Yes I would. Of course! You're a very different parent in real life than the woman you portrayed. How hard was it to play someone who probably did the opposite of what you do? MS: Not…well…that's what acting it. It takes what we know and puts it into the life of someone else. It's a great journey. You get to know how it is to walk in someone else's shoes. to live that life. To be impaled by their appetites and needs. For me it's like therapy, it's like understanding something about other people and about myself. I really love it and need it for that reason. Mamie Gummer: The advice my mom…she…her…mother…she said to always defend who you're playing. Not to speak for you, but the worst thing I think you can do is judge who you're playing. That's just counterproductive. This does happen. Women do leave home. They leave their families. I think that you have to understand why they felt that they had to do that. MS: That's true. What's neat about this screenplay, in my opinion, is that there's so many holes in it. There are so many mysteries and so many things you don't understand. We don't really know how much Ricki was in the lives of her children. For how long. How much she tried to be. Or when Maureen actually came into their lives. How early was she there? That's the stuff that we as individual actors, we make up our own story. I saw Kevin Kline in London, because he's making Beauty and the Beast and I was making a movie about a bad opera singer. We got together and talked about this movie. I said, “Why do you think this marriage broke up?” He gave a long, incredible…bogus, in my opinion, story. But it's not articulated in the movie. You don't know. They do investment banking in California. Nobody said you can't move. Somebody has a need to try. To make her dream come true. Maybe you say, “Ok, let's go”. Because you can do investment banking in LA. There's a lot of mysteries in this in why that marriage didn't work out. They don't seem as well suited as these two [gestures to Rick Springfield]. And she does seem happy in the life she has. RS: The cool thing about it is that everybody has issues in the story. Even at the end when it seems like a happy ending, you know it's all still going to go on after the movie starts. They'll still have issues. All in all, this press conference blew me away! To be in a room with such talented people who were so open to sharing their feelings and experiences is a true once-in-a-lifetime experience! Another once-in-a-lifetime moment came just minutes after the interviews ended and the talent from Ricki and the Flash walked out of the room. Meryl Streep, Rick Springfield and Mamie Gummer's name cards were still on the table, so a handful of bloggers decided to take a picture at the same table. 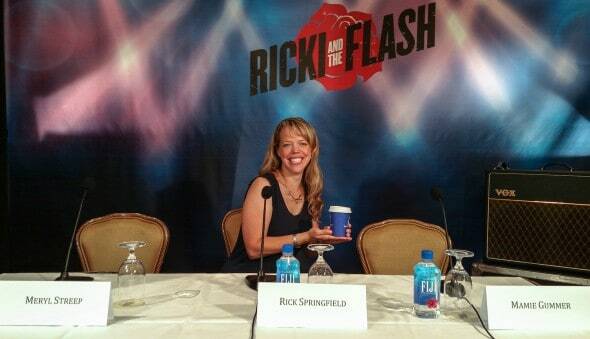 When I sat down, I noticed Rick Springfield had left his cup. Of course I took a picture with it. I also had just a few seconds to decide if I should take it or not! Can you guess what I did? 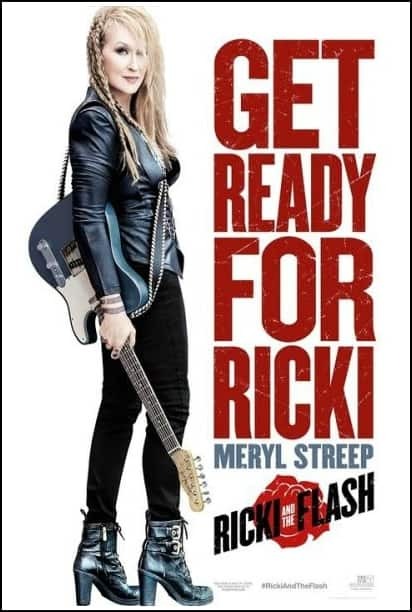 Ricki and the Flash opens in theaters everywhere on August 7th, 2015. Get your tickets today! 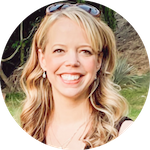 Be sure to take a look at my first post inspired by the plot of Ricki and the Flash: Moms: 5 Ways to Keep Improving Your Relationship with Your Daughter. Disclosure: Sony Pictures Entertainment flew me to New York to participate in this press junket and other events related to the promotion of Ricki and the Flash.